The hot, powdery sand sifts into every nook of my flip flop clad feet. It’s the same sand from which a garden has annually erupted for as long as I can remember – more than 3 decades. The same except for the fluffing of it by fertilizer; some years from the best fertilizer — shoveled from the chicken coop by my sister and me. The same exce pt for the fertilizer and the various crops of vegetables that have been rotated through to ward off the weariness from the same ole plants year in and year out. Gardens get bored too. Close to embarrassing myself in front of citified nephews that have no idea what a potato plant looks like, I recognize the row of plants from which my Dad has already enjoyed several suppers. Prying the plant from the ground takes a bit of doing. The soil is hard and protective of its treasure. 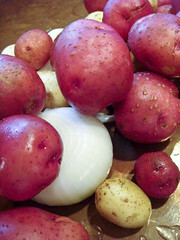 Large and small, red and white, the pebbled potatoes show themselves. 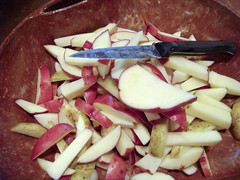 The tops are chopped; the potatoes drop into a brown paper bag. The same befalls the onions. 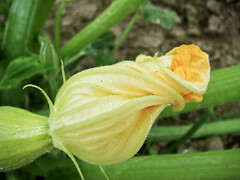 The yellow crooked neck squash is just blooming. Darn. And I don’t see any okra this year. Pride checks my yell to question where the okra might be. I grew up here. I should know this. The nephews are watching. 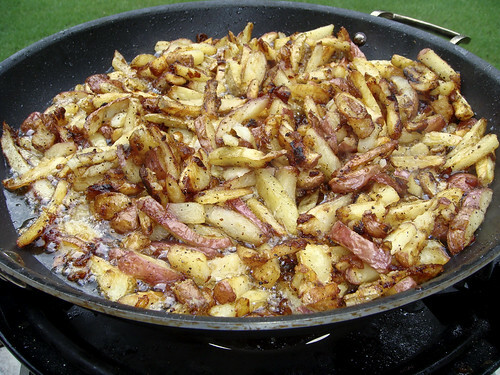 Every supper of my youth witnessed a platter of fried potatoes cooked in a black, tar bottomed cast iron skillet. Being the family cook most nights, I learned the process well. Like most dishes of this deceptively simple sort – biscuits, pie dough, venison, and fried chicken all fall in this lot, the lie behind the perceived ease to whip up one of these dishes drives many a Southern woman insane. In other words, there’s a technique. It takes the right temperature, the right amount of oil, when to turn, how much to turn, how long to leave the lid on while the potatoes soften to the perfect consistency before the browning begins, etc. A bit of yellow squash and/or okra if you have it or your parent’s is past the bloom stage and you can pluck whatever size you can get away with. And of course, find the okra. Oil — to your taste — I like peanut or vegetable oil. Canola will work. Olive oil too, but it will lend a different flavor. And then there’s lard. I don’t peel a new potato, but you can if you want. As far as the cutting up technique, I tend to cut the potato from end to end into something less than 1/4 inch slabs; then from side to side into shorter pieces but still about the same thickness. Chop the onions. For the yellow squash, I slice into rounds of about 1/4 inch. 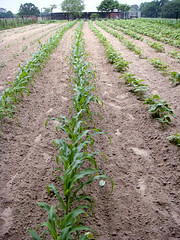 The same with the okra. Yep, all in the same bowl will do just fine. IF you’re using a bit of squash and/or okra with the potatoes, sprinkle some flour and cornmeal over everything. Sometimes I’ll do this even with just potatoes and onions. The grit from the cornmeal is a learned craving, or a crazed learning. Take your pick. Put enough oil in either a seasoned cast iron skillet, or a non-stick skillet (like the one I use when my Mom’s not looking) to come up to a bit less than 1/3 of the depth of the pan. You’re making fried potatoes here, NOT french fries, so we’re not deep frying. Heat the oil to about 375, or until a slice of potato sizzles. Dump it all into the pan. Salt and Pepper the top layer liberally and put on a lid, or like my Mom, turn a plate over the skillet. If the lid doesn’t rest firmly on the skillet, don’t panic. It will do its job just the same if resting initially on the heaping pile o’ potatoes. Here’s where the rocket science comes in: cook until the potatoes begin to soften (test with a fork), then remove the lid. Start checking the bottom of the potatoes for browning. Once they start browning, turn. Don’t expect to turn them like a pancake. No. Turn whatever your spatula will hold, then turn the rest the same way. Salt & pepper again. You may need to turn a few times after this first turn. They’re done, umm, when you say they are. You ARE the cook, aren’t you? Done correctly, you can pull them apart in chunks of alternating layers of creamy potatoes and crunch. P.S. They’re fantastic cold. If you have any left. For more foodie fun, check out Wanderfood Wednesdays over at Wanderlust & Lipstick! I made these potatoes tonight and HOT DAMN! they were good. They will enter my repertoire. Thanks! 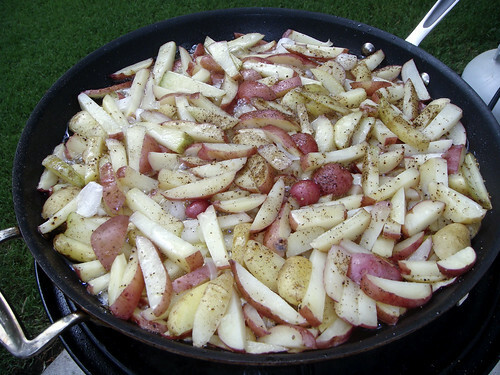 Ooh, I ‘m salivating at the thought of those potatoes sizzling in the pan & somehow they must taste even better having picked them from your veg patch – lucky for my waistline that I’m not there to eat them all.